How good does this bag storage area look? ARKit get 10/10 for their use of Safehook’s OZ-Ihooks in Black and Yellow. There is no question demountable classrooms have come a long way and ARKit’s new classrooms are no exception. Demountable classroom facilities in todays schools today are state of the art and Safehook are delighted to be able to provide products that keep with the trend. 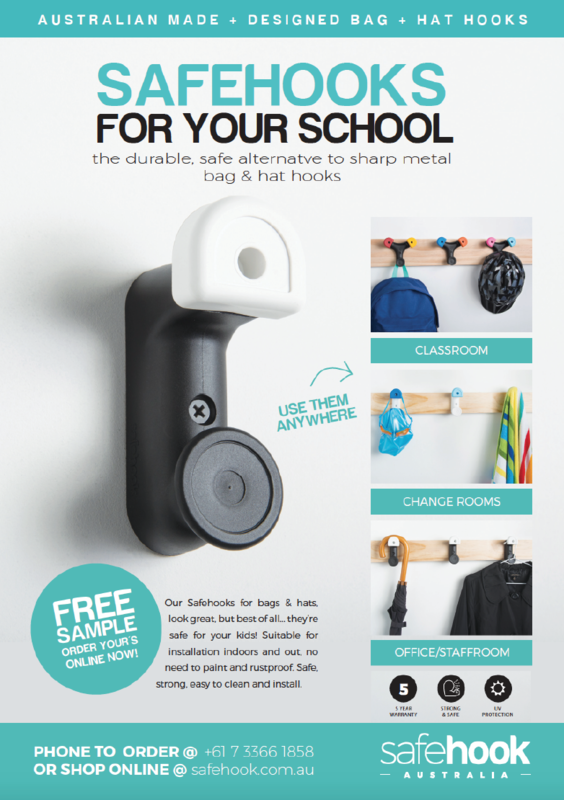 Easy to install, easy to clean, colourful, safe and strong, Safehook’s OZ-Ihook is the perfect choice for school bag and hat hook storage. OZ-I and OZ-Yhooks have been tested in house to support up to 150kgs, these hooks not only look good they’re tough and safe. Follow us on line, on Instagram or Face Book. Tested to support up to 150kgs, these hooks not only look good they’re tough and they’re safe. New to the safehook colour range in 2018 is Violet, and WOW doesn’t it look good? Over ten colours now available in the OZ-hook button line-up. Suitable for use with either the OZ-Yhook and or the OZ-Ihook, Violet buttons are now available for your selection. Available in mixed packs and or single colour ways, Violet OZ-hook buttons compliment our already comprehensive range of colour options that include Black, Scarlet, Grape (Green), Pink, Yellow, Blue, Sky, White & Tango. With three colour bases to select from your ability to mix your colours up and dress up your walls has never been greater. Manufactured in Australia from super tough injection moulded polypropylene, UV treated for serious outdoor use. Both our OZ-Y and our OZ-I hook’s are perfectly suited for use in schools, sporting clubs, public swimming pools, hospitals, construction, the home and more. Our OZ hook range has been ergonomically designed with function in mind. Both our OZ hooks offer smooth unobtrusive design that is safe on clothes and safe on people. No sharp edges or protrusions. 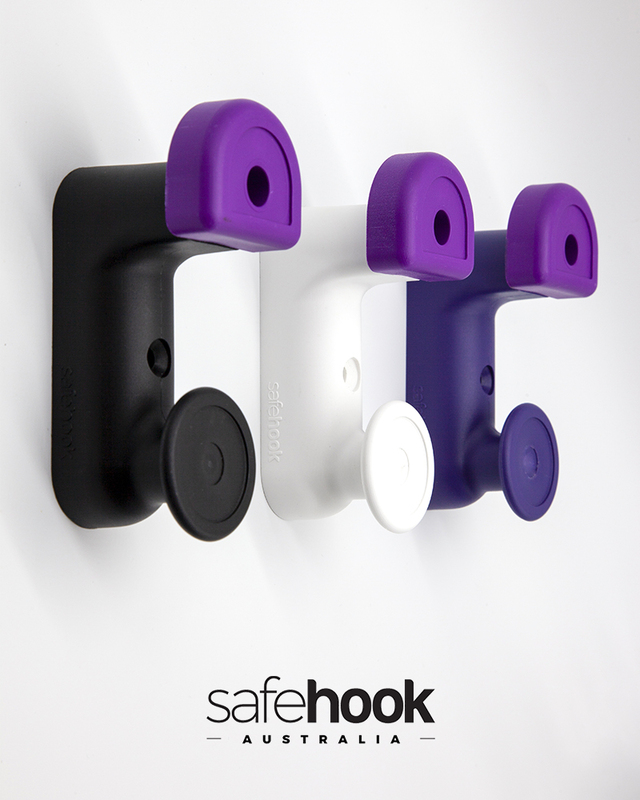 We are frequently asked how to install our Safehook products. Safehook products are designed to be installed indoors or out. They are manufactured from a moulded UV stabilised polypropylene, and as is the case with the OZ-Y and the OZ-I hooks are supplied with stainless steel screw fixings, our Euro hooks are supplied without screws. Generally, we suggest all hooks be fitted to a timber rail or similar, which in turn is fixed to a wall. Fitting your new hooks this way will save considerable time and effort especially if the final installation surface is masonry. A good example of how to install Safehook OZ-Ihooks. Hooks fitted to a 140mm wide Merbau substrate screwed to the wall. Without wishing to appear to be state the obvious, some substrates are stronger and more stable than others. We do recommend hooks be fixed to a solid timber rail or panel at least 18mm thick and at least 85mm wide, this will best support the body of each hook as its important to ensure top and bottom screw fixing points are at least 20mm from the edge of the timber substrate. Our OZ-Y and OZ-I hooks are supplied with stainless steel wood screws. Screws supplied with this product are suitable to be fixed to a 30mm thick substrate, anything less than this will result in she screws supplied popping through the back of the substrate. In the case of both these products we recommend a timber substrate at least 100mm wide, noting it is possible to fix these products successfully to a narrower substrate no less then 85mm in width. Whilst it is possible to fit any of our Safehook products directly to a dry wall or similar we do not recommend this installation method as the load capacity of each hook will be significantly reduced. We suggest a qualified person be consulted prior to installing any hooks, this person should be suitably capable of determining the strength of the wall the hooks are to be fitted to and the most suitable method to best fix your hooks the wall. As always if in doubt ask. For more information and or to buy our products visit the Safe Hook web site www.safehook.com.au and or call 07 3366 1858 we’d be happy to help you. We look to our schools to provide a safe learning environment for our children, and in the main Australian schools do a good job with the funds they are allocated. So does school funding go far enough, and how do schools set their priorities and balance expenditure against funding allocations? More and more schools tell us they rely on contributions from Parents and Citizens to make ends meet. Schools do what they can when they can. School funding is clearly inadequate. How often do items on that list of things to do roll over from one year to another as a result of lack of funding and or resource, and what is the final cost of ignoring fixing issues early in the piece? The cost of providing a safe work place, & or not providing a safe work place in today’s schools is increasing annually, with increased costs of premiums and claims, costs considerable by any account. Water on the floor & slippery pathways. General housekeeping and attention to detail addresses most of the above, like picking up loose cords and cleaning up spills etc, the obvious normally attended to quickly, unfortunately some of the above does go unattended. Hazards like narrow walkways, poor lighting, obscured vision, uneven floors etc are often overlooked due to shortfalls in funding, worse still they have been there so long they’re considered every day. Today’s modern buildings address much of the above through compliance to standards such as AS1428 and the Australian building code, standards and codes that are prescriptive in detail related to new building design. However, many of our schools were designed and built prior to current building regulations and standards, many older buildings unwittingly accumulating hazards, most adopted as good ideas at the time. A example of an adopted hazard is where walkways are obstructed or narrowed as a result of the introduction of furniture like seating, lockers or bag racks (fixed and or loose) outside classrooms, specifically those areas where walkways are already tight for example second story balconies etc. The problem of clutter on the floor is an ever-present issue both for new and old builds. The most popular example of which results from school bags dumped on the ground in front of doorways and in passageways forming not only a potential trip hazard’s, as they do obstructions to emergency egress paths. Insurance companies will tell you that understanding your responsibility in attending to existing and potential hazards is important, and it is. So, what is the cost of ignoring hazards? The answer is significant. Safehook Australia can help. Safehook offer an affordable means of providing wall storage for bags, hats and clothing, getting gear off the floor and onto the wall. Our products are compact, built tough, suitable for indoors and or outdoor installation and designed to minimise trauma associated with falling against the product. Replacing bag racks and lockers with bag hooks not only potentially increases walkway space, it reduces cleaning, and reduces maintenance, offering reduced costs, savings that over time add up, aside from other benefits of increasing visibility and improving general safety (no place for rubbish and or other more sinister things to hide), our products are affordable, quick and easy to install. Safe Hook OZ-hooks, getting gear off the floor and onto the wall easily. Installing Safe Hook products indoors or outdoors isn’t a problem. Built from hard wearing injection moulded polypropylene our products are manufactured using UV stabilised materials, this makes our hook products last longer, in even the most severe climates. These hooks are truly more then just tough hooks. Both of our OZ-hooks are supplied with heavy duty stainless steel fixings that add to the strength of these products. We tested these products to support up to 150kgs without failure and are happy they will more then adequately pass muster. Strong, Functional and Safe our OZ-hook products are designed and manufactured in Australia and suitable for use in most commercial environments, schools, colleges, healthcare facilities, clubs as they are at home. 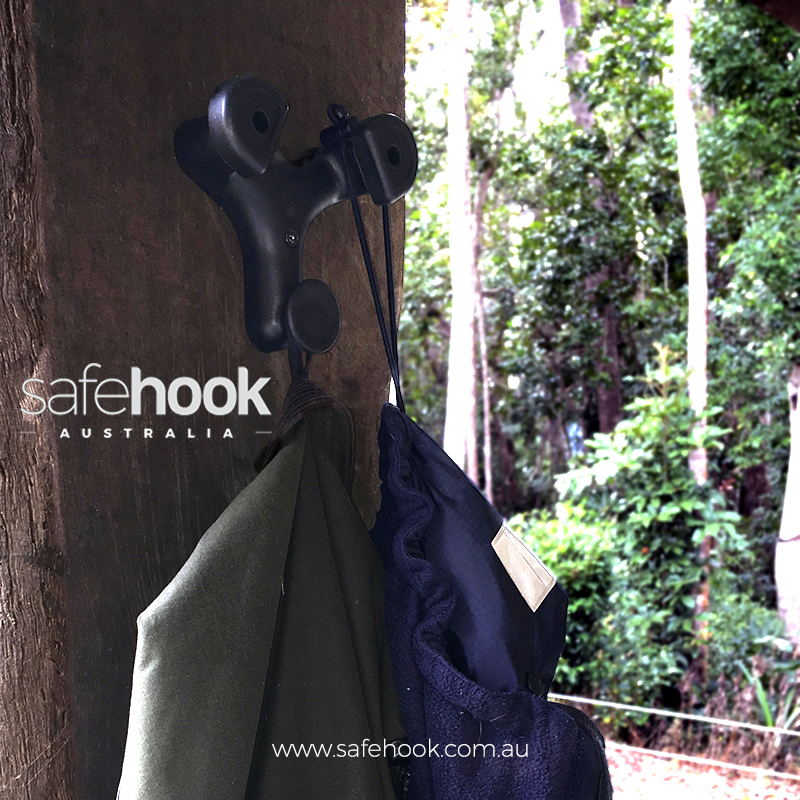 Safehook’s reputation as a supplier of quality bag and hat hooks is rapidly gaining momentum. Testimony to this is the fact that many of the orders for our bag and hat hooks come from existing customers, customers who are happy with our products and the contribution our products make to keeping bag and hat areas organised and safe. 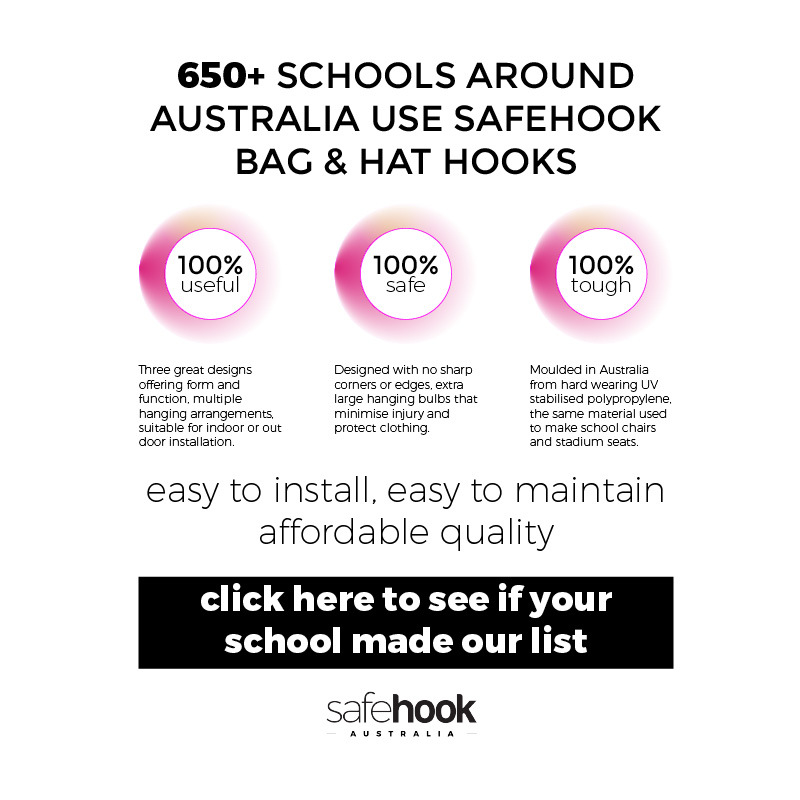 Our installations list is by no means complete, it grows daily, it will however give you an idea as to just how well received our bag and hat hook products have been received across Australia. 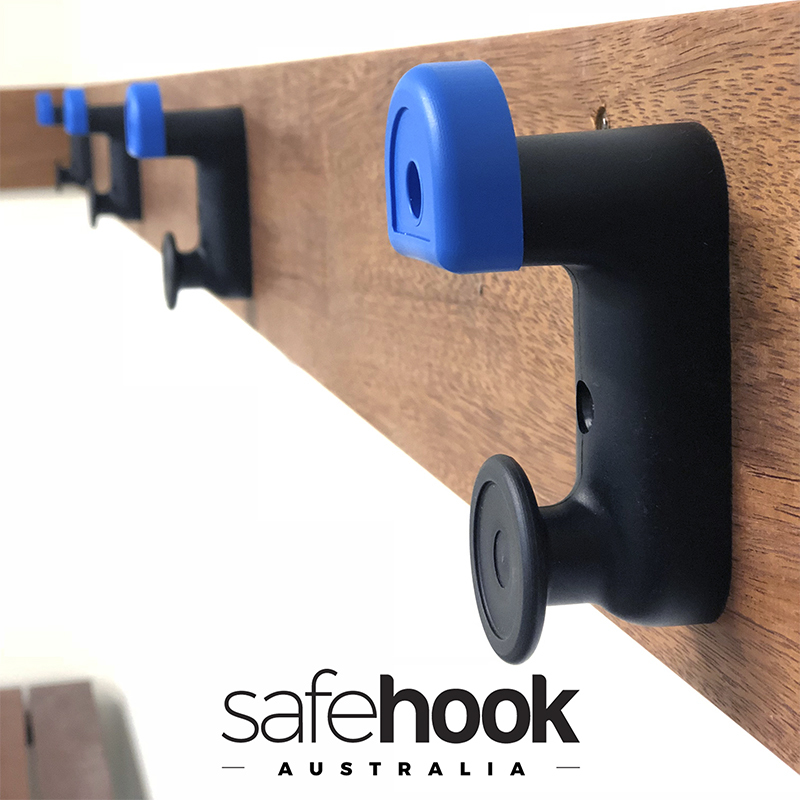 If you’re considering buying new bag and hat hooks why not talk with someone already using our products, asked them what they think about Safehook, whether it be our Euro hook or one of our OZ hook products we are confident that our customers will tell you just how good they are. If your school is not on our list then we are happy to help you. Call or enquire on our web site we welcome your enquiry. 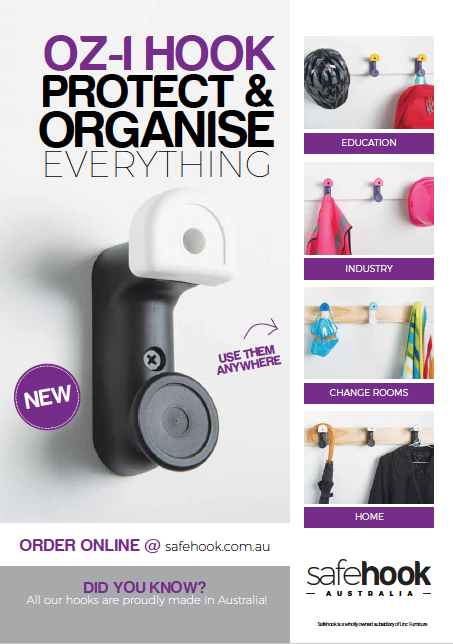 Exciting news Safehook Australia’s latest OZ-Ihook brochure is available for down load now. If its not a “Safehook” its simply not a safe hook! 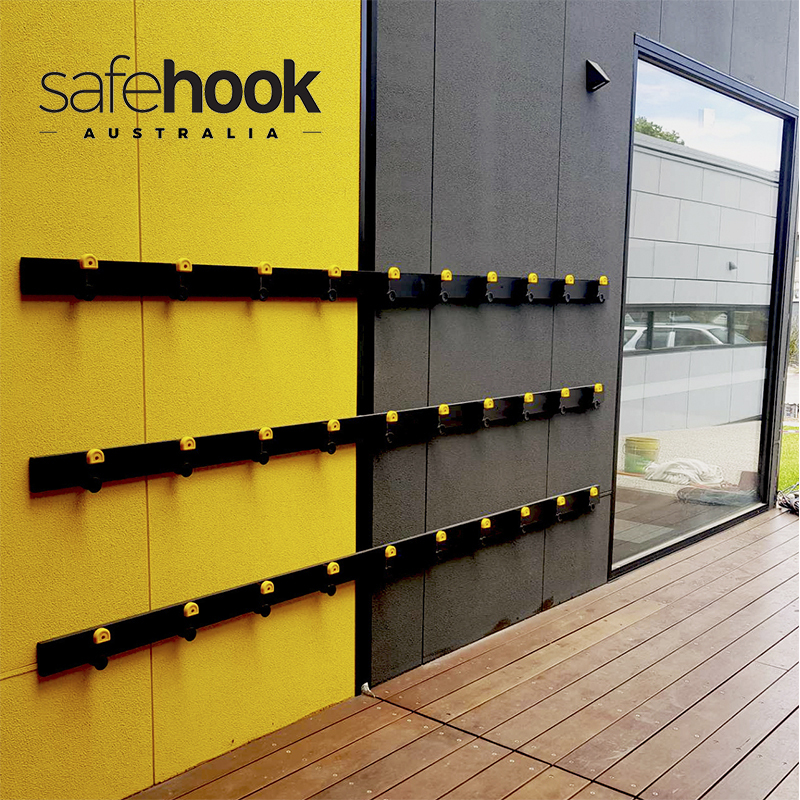 Find out more about this wonderful new product by visiting the Safehook web site at www.safehook.com.au or download a copy of our latest brochure by clicking here. 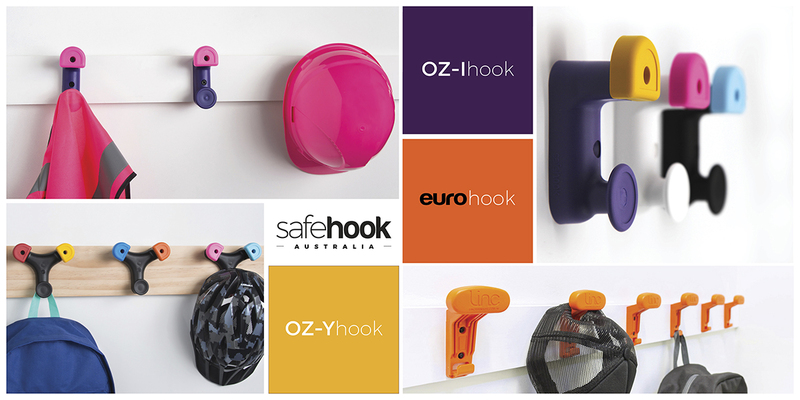 Designed and manufactured in Australia the OZ-Ihook makes a welcome addition to the Safehook range of Bag and Hat hooks. Manufactured from UV stabilised polypropylene the OZ-Ihook has been made for indoors and or outdoors installation. Available in a range of colours the OZ-Ihook is sure to please. How Safe Is Your School’s Bag Storage Area? So here’s the problem. Does it look familiar? Just how safe are the hooks used in your school? The unfortunate answer is hooks like those shown above are down right dangerous and as is the case with so many Australian schools this is an all too familiar sight. Most of these sort of Metal hooks are easy to break and often over looked when it comes to maintenance. Positioned conveniently at Child head height the result of a child falling against one of these hooks leaves little to the imagination as to the potential damage caused. Reports of injuries associated with such accidents are often severe and in some cases life changing. Is it any wonder that some school authorities are moving towards banning the use of these styles of hooks all together? So just how easy is it to fix this problem and what are the options? Replacing existing hooks with a safer hook option. Installing Pelmets is an expensive option that adds to the on going issue of maintenance, bag racks whilst popular are expensive, space consuming garbage collecting devices. The option of replacing existing hooks with a safe hook is hands down the best and easiest option to consider. Products like Safehook’s Euro hook or our OZ-Y or OZ-I Hook’s provide an affordable, easy to maintain Safe alternative to sharp metal hooks. Moulded from hard wearing UV stabilised polypropylene our Safehook products can generally be installed onto the same substrate as was the dangerous metal hooks being replaced, so in the end it may be as easy as unscrewing one hook and fitting your new Safehook. Pretty simple and pretty inexpensive. What makes Safe Hook products safe? No sharp corners or protrusions, large hook bulbs purposly designed with flat surfaces to reduce the potential for injury, hooks designed and manufactured from hard wearing polypropylene that doesn’t break down quickly or become brittle like other materials, easy to maintain and easy to service, a colour range that includes high visability options that help define boundaries. On top of which our Safehook products are strong. Posted in Safehook News & Info -Leave a Comment on How Safe Is Your School’s Bag Storage Area?